A local resident sits at the site of the fire in central Rostov that damaged or destroyed 123 residential buildings and killed one man. Valentina Livshits says the mysterious visitors came to her in Rostov-on-Don about a month ago, offering to buy her plot of land in the center of the southern Russian city at a knockdown price. The two men said they were "realtors" who "must report to the head of the city administration" about their "work with residents," Livshits, 62, told RFE/RL's Russian Service. "They got very upset when I refused. They vowed that the court wouldn't rule in my favor and that I'd simply be kicked out of my home," she said. Stories of similar ominous visits to the neighborhood by unidentified men had been bubbling for weeks before a massive fire tore through the area on August 21, damaging or destroying 123 residential buildings and killing one man. Numerous locals believe the blaze was deliberately set amid a battle for land in a rundown district that locals call "Govnyarka," or "Crapville." The neighborhood is not far from the picturesque Don River, on the other side of which a stadium is being built as a venue for soccer's 2018 World Cup. The land under the neighborhood "is golden," says Yelena Romanova, editor in chief of the local business-news portal Delovoi Kvartal. "Everyone wants to build something here," she tells RFE/RL. Locals have likened the deadly fire to the violent turf wars that plagued Russia in the 1990s -- an era that President Vladimir Putin has invoked to highlight the comparative stability in the country during his 17 years in power. Authorities have opened arson and criminal-negligence investigations. Rostov Governor Vasily Golubev told reporters this week that local residents had said that "on numerous occasions, various types of realtors approached them and offered to buy their homes or land for a reduced price." "People are saying that this crime, one could say, was done in the interest of developers and investors. And I believe that people have made these claims for a good reason. But all of this requires verification," Golubev said. Firefighters search through debris from the blaze in Rostov-on-Don. Romanova told RFE/RL that smaller fires had been occurring regularly in the neighborhood in the run-up to the massive blaze. Ruzanna Bagdasaryan was one of the neighborhood residents who lost property in the fires. Her three homes went up in flames in early August. She says that three months before she lost her homes, she rejected an offer from people identifying themselves as realtors to purchase her property. "But I refused, because five families live in these homes -- all are my relatives," she tells RFE/RL. "We didn't want to live in different apartments on the outskirts of town, and we wouldn't have enough money to buy a house in the center. I was fine with how things were. I didn't want to move." Four days before the August 21 fire that tore through the central neighborhood, a local news outlet published a report showing local residents complaining to Aleksandr Shevchenko, a district official, about individuals approaching them and pressuring them to sell their properties. In the testy exchange, Shevchenko advised residents to demand identification from the visitors and to call the police. He said the purported realtors had nothing to do with the local administration. One of the residents mentioned to Shevchenko a company called Megapolis. That firm has been selling off properties purchased in the area after ending plans for a commercial center there, the Russian business daily RBK reported in May. The newspaper reported that Megapolis had primarily been selling the properties to private commercial entities, not to state structures. Megapolis could not be reached for comment. The company is a subsidiary of the European property developer Atrium European Real Estate Limited, which describes itself as the "owner, operator and redeveloper of shopping centers and retail real estate in Central and Eastern Europe." Representatives for Atrium European Real Estate Limited declined to comment on the company's activities in Rostov-on-Don when reached by RFE/RL on August 25. Livshits told RFE/RL that Megapolis was buying up properties in the neighborhood between 2004 and 2011, and that people were happy with the prices it offered. She said no one in the neighborhood knew on whose behalf the self-identified realtors approaching residents recently were working. 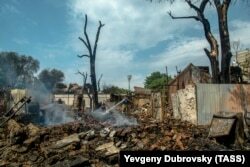 Golobev has appealed to Russian Prime Minister Dmitry Medvedev to request more than 605 million rubles ($10 million) to deal with fallout from the fire, including compensation for victims, the Rostov governor's office said in an August 24 statement. A total of 692 Rostov-on-Don residents have sought assistance in connection with the fire, which in addition to killing one man left 72 people injured, including nine who were hospitalized, the statement said. Several people who lost their homes in the fire blame the authorities for failing to protect them from what they believe was a campaign to push them out of their homes under the threat of violence -- a practice used by what are known in Russia as "black realtors." "How many times have we told them that we're being set on fire?" a woman who gave only her first name, Marina, said in an interview at an emergency center for victims. "And all that I have now is a bathrobe, slippers, and socks that my neighbor just gave me." Livshits, the pensioner who told of the mysterious "realtors" that came to her asking to buy her property for a cut-rate price, told RFE/RL that her home escaped the August 21 fire. She was on the record nearly two weeks earlier warning about what she believed was an attempt to intimidate her into selling. "They started threatening me, saying, 'Well, there will be three courts, and you'll be tossed out to live in a dormitory," Livshits was quoted as saying in an August 10 report by the local news portal Donnews.ru. The same report quoted a local resident named Nina Reshetnik as saying that "some people" had visited her a month earlier. After she turned down the price they offered, Reshetnik said, they warned her, "'Then it will be easier to burn you rather than pay.'"